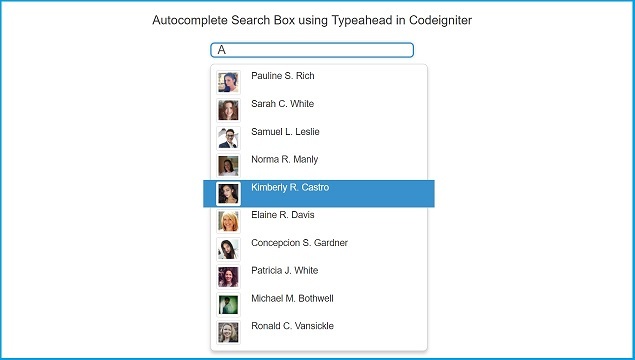 In this post We are going to discuss how to make autocomplete or auto search or auto suggest textbox in Codeigniter application by using Typeahead.js bootstrap jquery plugin. By using Typeahead.js plugin with Codeigniter framework we will make dynamic real time auto suggest search box with not only display text suggestion data but also it will also display images with auto suggest search. In most of the tutorial you can find simple how to use typeahead.js with Codeigniter framework and it will only describe autocomplete search records below textbox, but in this tutorial we have also add one more feature like how to load images in Autocomplete search with custom html template using typeahead.js plugin. So when we have type something in textbox then it will not only autocomplete search but also it will also load images with autocomplete search also using typeahead.js with codeigniter. This is first step and in this we have to create one table and in this table we have insert some dummy data. For this we have make one "tbl_student" table and inserted some records which you can find below. Now we have to make database connection by defining required information like hostname, database name, username and password. By this credential we can make database connection in codeigniter. After making of database connection in Codeigniter Application then we have to make controller for handle http request. So, here we have make Autocomplete Controller in application/controllers folder. This controller will received user request and it will send request to model and from model it will received data which it will send to view file. Here index() method will load root of this controller and fetch() will received ajax request for fetch data. After Creating controllers we have to make models, in this model we can perform database side operation, so here we will write login for search data from mysql table, which we can found below. So, this is complete step by step process for how to use Typeahead.js with Codeigniter framework and make autocomplete textbox in which we have load images with search result on webpage. on selecting the fetch data its not showing on input box.